Ship: MSC Preziosa - built 2013. Find out more about the ship or accommodation. Venice is one of the most interesting and lovely places in the world. One of Italy's top travel cities is a beautiful, romantic destination with many attractions as you'll find many magnificent churches and palaces, lively squares, and interesting shops. Founded in the 5th century out of the necessity of fleeing the Barbarian Invasion and spread over 118 small islands, Venice became a major maritime power in the 10th century. The whole city is an extraordinary architectural masterpiece in which even the smallest building contains works by some of the world's greatest artists such as Giorgione, Titian, Tintoretto, Veronese and others. Venice and its lagoon were added to the list of UNESCO World Heritage Sites in 1987. The islands are connected by more than 400 bridges over its 150 canals. The Grand Canal, or Canal Grande, the main thoroughfare of Venice lined with beautiful buildings is like a main street, cutting through the centre of the city. As there are no cars in the city, the main public transport are the vaporetti boats and naturally, gondolas, for the ultimate romantic experience. Some of the most memorable attractions are the main St. Mark's Square, the centre from which rises the homonymous, five-domed St. Mark's Basilica. Next to the Basilica stands the impressive Dodge's Palace or Palazzo Ducale, the political and judicial hub of Venetian government until the fall of the Venetian Republic in 1797. The palace was connected to its prisons by the famous "Bridge of Sighs". The bridges of this “Most Serene Republic” (Serenissima) leave a grand impression, with the Bridge of Sighs and Ponte Rialto being the most famous ones. The year 1204 saw Venice allied with the Crusaders to capture Constantinople. The abundant booty brought back on that occasion, including the bronzes horses of St Mark's, is only the more spectacular part of the loot from Byzantium that the Doge Enrico Dàndolo shared with his allies. Under the Doge, a maritime empire of unequalled power extended over the entire length of the shores around the eastern Mediterranean, to the islands of the Ionian Sea and to Crete. During the entire period of the expansion of Venice, over the centuries when it was obliged to defend its trading markets against the commercial undertakings of the Arabs, the Genoese and the Ottoman Turks, as well as those of the European monarchs who were envious of its power, Venice never ceased, in the literal sense of the term, to consolidate its position in the lagoon. The climate in Venice is Mediterranean, but rather wet throughout the year. The most pleasant periods are spring and from mid-September. Winter is cold, with frequent fogs and sometimes some freezing in January. Summer - July and August - is often very hot and wet with high points which exceed 35 degrees and violent storms possible. Venice is frequently in flood which presents a constant threat for the city. Venice has a relatively temperate climate, with temperatures rarely descending below freezing during the day, or rising much above 35°C. The most pleasant periods are spring and from mid-September. Weather in September is nice; average daily highs around 75°F/24°C, and evenings around 65°F/18°C. Bari is the capital of the Apulia region of Italy, a bustling commercial centre and port. It's mostly famous for being one of the exit doors of Italy, where travellers leave on ferries for neighbouring countries. The city authorities, however, have been trying to raise its tourism profile and awareness of Bari's old town, which has retained its ancient medieval plan and contains many historic buildings and sites. One of the most interesting attractions in Bari is the ancient part of the city, called Bari Vecchia by locals, literally Old Bari, a beautiful mediaeval neighbourhood. Here, you will find many lovely churches, the romanic Basilica of Saint Nicholas with its gold ceiling, its crypt and the magnificent cathedral of Bishop Elias. In the same square there is also the Palazzo del Catapano and the Church of Saint Gregory. Even older (but later refurbished in baroque style) and equally interesting is the Romanic Cathedral of Saint Sabino. Also interesting are the Petruzzelli Theatre, one of the grandest opera houses in Italy after La Scala in Milan and the San Carlo Theatre in Naples, and also the Swabian castle. Bari enjoys a semi-arid Mediterranean climate with mild winters and warm to hot, dry summers. Weather in September is nice; average daily highs around 26°C, and evenings around 16°C. Italy is a long peninsula shaped like a boot, surrounded on the west by the Tyrrhenian Sea and on the east by the Adriatic. It is bounded by France, Switzerland, Austria, and Slovenia to the north. The Apennine Mountains form the peninsula's backbone; the Alps form its northern boundary. Several islands form part of Italy; the largest are Sicily which is at the southern tip (the "toe") of the boot and Sardinia, an island off the west coast of Italy. Together with Greece, it is acknowledged as the birthplace of Western culture. Not surprisingly, it is also home to the greatest number of UNESCO World Heritage Sites in the world. High art and monuments are to be found everywhere around the country. It is also famous worldwide for its delicious cuisine, its trendy fashions, luxury sports cars and motorcycles, diverse regional cultures and dialects, as well as for its many beautiful coasts, alpine lakes and mountains (the Alps and Apennines). No wonder it is often nicknamed Il Bel Paese (The Beautiful Country). The climate of Italy is highly diverse, and could be far from the stereotypical Mediterranean climate. Most of Italy has hot, dry summers, with July being the hottest month of the year. Winters are cold and damp in the North, and milder in the South. Conditions on peninsular coastal areas can be very different from the interior's higher ground and valleys, particularly during the winter months when the higher altitudes tend to be cold, wet, and often snowy. The Alps have a mountain climate, with cool summers and very cold winters. Convert EUR to USD HRK (using FX Currency converter). Katakolon is a seaside town in western Ilia in the municipality of Pyrgos. The town centre is within a gulf overlooking the Ionian Sea. Katakolon is situated on a peninsula and has a lighthouse found in the southwest. The Lighthouse of Katakolon was first opened in 1865 and the town has a population of 513 inhabitants. Katakolon is a gateway to Olympia, a UNESCO World heritage site, where the ancient Greeks flocked every four years for more than a millennium to celebrate the sacred games dedicated to Zeus. The site of Olympia, in a valley in the Peloponnesus, has been inhabited since prehistoric times. In the 10th century B.C., Olympia became a centre for the worship of Zeus. The Altis – the sanctuary to the gods – has one of the highest concentrations of masterpieces from the ancient Greek world. In addition to temples, there are the remains of all the sports structures erected for the Olympic Games, which were held in Olympia every four years beginning in 776 B.C to the 4th century AD. The Altis consists of an unordered arrangement of various buildings. Enclosed within the temenos (sacred enclosure) are the Temple of Hera (or Heraion/Heraeum) and Temple of Zeus, the Pelopion and the area of the altar, where the sacrifices were made. The sanctuary contained one of the highest concentrations of masterpieces of the ancient Mediterranean world. Many have been lost, such as the Olympian Zeus, a gold-and-ivory cult statue which was probably executed by Pheidias between 438 and 430 BC. Other masterpieces have survived: large votive archaic bronzes, sculptures of tympanums and metopes from the Temple of Zeus, and the Hermes by Praxiteles, found along with its base in the Temple of Hera. Outside the Altis, to the east, were the Stadium and the Hippodrome, where the contests took place; on the west were the Palaestra, or wrestling school, and the Gymnasium, where all competitors were obliged to train for at least one month. The visitor can walk through the impressive ruins of the area where athletes trained and run in the ancient stadium; just as the ancient Olympians did after their victory 3000 years ago. They can also visit the museum and get the chance to see some unbelievable sculptures such as the sculpted decoration of the temple of Zeus, one of the Seven Wonders of the Ancient World, the famous Hermes by Praxiteles and the statue of Nike of Paionios. The Olympiad - the four-year period between two successive celebrations falling every fifth year - became a chronological measurement and system of dating used in the Greek world. The significance of the Olympic Games demonstrates the lofty ideals of Hellenic humanism: peaceful and loyal competition between free and equal men, who are prepared to surpass their physical strength in a supreme effort, with their only ambition being the symbolic reward of an olive wreath. Olympia’s weather is mild in the months of April to September. Average temperatures in September are 28 °C (average high) and 18 °C (average low), and rainfall is generally below 8 cm. Greece is a country in Southern Europe, with extensive coastlines and islands in the Aegean, Ionian, and Mediterranean Seas. It shares borders in the north with Albania, the Former Yugoslav Republic of Macedonia (FYROM), Bulgaria, and Turkey. It has an ancient culture that has had a significant influence on the arts, language, philosophy, politics, and sports of western society, including the genres of comedy and drama, western alphabets, Platonic ideals and the Socratic method, democracies and republics, and the Olympics. Furthermore it's a geographically appealing place to visit, with a mountainous mainland and idyllic island beaches. 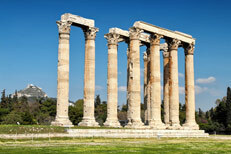 Greece is one of the world's most popular tourist destinations, ranking in the world's top 20 countries. Visitors are drawn to the country's beaches and reliable sunny summer weather, its nightlife, historical sites and natural beauty. Architecture varies greatly from one region to the next depending on the local history. Visitors will find neoclassical architecture in the cities of Ermoupolis and Nafplion, Ottoman-influenced buildings in Grevená and Kozáni, whitewashed Cycladic homes on the island of Paros, and pastel-colored baroque homes and churches on Corfu. The nation's terrain is just as varied as its architectural heritage: idyllic beaches, towering mountain ranges, wine-producing valleys, vast stretches of olive orchards in the south, and lush forests in the north. Greece boasts a very long history, with the Greek language being present in the country for nearly 4000 years. Despite its small size, Greece has a varied climate. Most of the country, including all coastal areas, enjoys a so-called Mediterranean climate, almost identical to much of California. Summers are hot and dry with a 7-month period of near-constant sunshine generally from April until November. The remainder of the year is characterized by a relatively cold, rainy period which generally starts sometime in November and lasts until late March or early April. The most pleasant weather occurs in May-June and September-October. Izmir is a large metropolis in the western extremity of Anatolia and the third most populous city in Turkey. It is a proudly liberal, developed, and at the same time, busy commercial centre. At the west of Izmir lies the Çeşme peninsula, with its wonderfully coloured sea, beaches and thermal centres. Izmir is one of the fastest-growing cruise-ship ports of call on the Aegean and an excellent base for trips to nearby Ephesus and Pergamon. Ephesus located near the Aegean Sea in modern day Turkey, was one of the great cities of the Greeks in Asia Minor and home to the Temple of Artemis (completed around 550 BC), one of the Seven Wonders of the World. In 268 AD, the Temple was destroyed or damaged in a raid by the Goths. It is nominated for the UNESCO World heritage list. Ephesus was one of the seven churches of Asia that are cited in the Book of Revelation. The Gospel of John may have been written here. The city was the site of several 5th century Christian Councils. It is also the site of a large gladiators' graveyard. 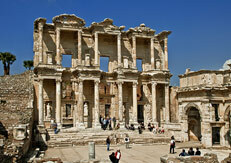 Ephesus was at its peak during the 1st and 2nd century AD. It was a major Roman city second in importance and size only to Rome. Ephesus has been estimated to be about 400,000 inhabitants in the year 100 AD, making it the largest city in Roman Asia. Once, a trade centre of the ancient world, a religious centre of the early Christianity and today, an important tourism centre in Turkey as numerous tourists come to see this best-preserved Roman city in the Mediterranean region. Together with Milet, Ephesus was one of the two most important centres of science, art and culture. The ancient site was the birthplace of many prominent names such as the philosopher Heraclitus, the diviner Artemidorus, the poets Callinus and Hipponax, the grammarian Zenodotus, and the physicians Soranus and Rufus. Despite several dredging and rebuilding efforts, Ephesus' harbour continued to silt up. Malarial swamps developed, the seaport was lost, and the lucrative Artemis/Diana cult diminished. In AD 263, Germanic Goths sacked Ephesus, marking the decline of ancient Ephesus as well as the Roman Empire. Part of the ancient city was destroyed by an earthquake in AD 614 while the other part remained fairly well preserved until the present day. Just like Izmir, Ephesus is rather hot and dry in the summer and mild and rainy in the winter as typical of an area with a Mediterranean climate. Just like Izmir, Ephesus is rather hot and dry in the summer and mild and rainy in the winter as typical of an area with a Mediterranean climate. In autumn, temperatures in Ephesus start to decrease with September reaching average highs of 29°C and average lows of 17°C. Istanbul is Turkey's most populous city, and its cultural and financial centre. With its strategic location on the Bosphorus peninsula between the Balkans and Anatolia, the Black Sea and the Mediterranean, Istanbul has been associated with major political, religious and artistic events for more than 2,000 years. It had a remarkable strategic position along the historic Silk Road, rail networks to Europe and the Middle East, and the only sea route between the Black Sea and the Mediterranean. The Historic Peninsula, on which the former Byzantium and Constantinople developed, was surrounded by ancient walls, built initially by Theodosius in the early fifth century. The city’s masterpieces include the ancient Hippodrome of Constantine, the 6th-century Hagia Sophia and the 16th-century Süleymaniye Mosque, all now under threat from population pressure, industrial pollution and uncontrolled urbanization. Istanbul's population is estimated to be between 12 and 19 million people, making it also one of the largest in Europe and the world. Founded on the Sarayburnu promontory around 660 BC as Byzantium, the city now known as Istanbul developed to become one of the most significant cities in history. For nearly sixteen centuries following its reestablishment as Constantinople in 330 AD, it served as the capital of four empires: the Roman Empire (330–395), the Byzantine Empire (395–1204 and 1261–1453), the Latin Empire (1204–1261), and the Ottoman Empire (1453–1922). It was instrumental in the advancement of Christianity during Roman and Byzantine times, before the Ottomans conquered the city in 1453 and transformed it into an Islamic stronghold and the seat of the last caliphate. Although the Republic of Turkey established its capital in Ankara, palaces and imperial mosques still line Istanbul's hills as visible reminders of the city's previous central role. The Outstanding Universal Value of Istanbul resides in its unique integration of architectural masterpieces that reflect the meeting of Europe and Asia over many centuries, and in its incomparable skyline formed by the creative genius of Byzantine and Ottoman architects. The Historic Areas of Istanbul were added to the UNESCO World Heritage List in 1985. It includes locations such as the Galata Bridge, the Seraglio Point where the Topkapı Palace is, the Hagia Sophia, the Sultan Ahmed Mosque, the Yeni Mosque near the Galata Bridge, the Beyazıt Tower and the Süleymaniye Mosque. Istanbul has a temperate oceanic climate which is influenced by a continental climate, with hot and humid summers and cold, wet and occasionally snowy winters. The city has a high annual average rainfall of 844 mm (which is more than that of London, Dublin or Brussels, whose negative reputation Istanbul does not suffer), with late autumn and winter being the wettest, and late spring and summer being the driest. Istanbul has a temperate oceanic climate which is influenced by a continental climate, with hot and humid summers and cold, wet and occasionally snowy winters. The city has a high annual average rainfall of 844 mm (which is more than that of London, Dublin or Brussels, whose negative reputation Istanbul does not suffer), with late autumn and winter being the wettest, and late spring and summer being the driest. The weather is still fantastic in Istanbul in September, which is a great time to visit if you want to enjoy high temperatures and plenty of sunshine without being stuck in the large crowds that the summer months attract. Temperatures can soar up to 23°C during the day, cooling slightly after sunset to 16°C. Turkey is situated on the Mediterranean, in the Anatolian region of West Asia, with a small section in South-eastern Europe separated by the Turkish Straits (Bosporus, Sea of Marmara, and Dardanelles). With the Black Sea to the north and the Aegean Sea in the west and Mediterranean Sea to the southwest, Turkey is surrounded by Bulgaria and Greece to the west, Armenia, Azerbaijan and Georgia to the northeast, Syria, Iraq and Iran to the southeast. Turkey is the cradle of cultures and civilizations connecting Europe and Asia. Many empires ranging from the Sumerians to the Hittites, the Lydians to the Byzantines and the Seljuks to the Ottomans have once thrived and expired within the borders of Turkey. Located at the mid-point of the European, Asian and African continents, Turkey has a varied geography rich in mountains, plains, caves, seas and many other natural formations and beauties. All types of sports activities and more specifically outdoor sports can be done amidst a breath taking nature providing both for adrenaline and entertainment. The most important distinctions are between the coast with its moderate winter temperatures and hot, humid summers, and the inland areas with their extremely cold winters and excessively hot summers. Spring (April to May) and autumn (September to October) are the best times to visit, since the climate will be perfect for sightseeing in İstanbul and on the Aegean and Mediterranean coasts. Convert TRY to EUR USD HRK (using FX Currency converter). Dubrovnik is a medieval city on the Croatian side of the Adriatic coastline and a treasure - trove of cultural - historical monuments that were created throughout its thousand-year existence. The walls of Dubrovnik girdle a perfectly preserved complex of public and private, sacral and secular buildings representing all periods of the City's history, beginning with its founding in the 7th century. 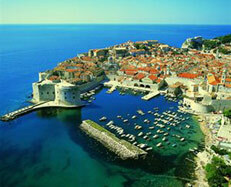 Since 1979 Dubrovnik is in the register of UNESCO as a protected World heritage. Particular mention should be made of the city's main street in the old historical center - Stradun, Rector's Palace, St. Blaise’s Church, Cathedral, three large monasteries, Custom's Office and the City Hall. The geographical position of this region is typically Mediterranean with mild and wet winters, and hot and humid summers (2,600 hours of sunshine on average). The average annual precipitation is 1,250 mm, air temperature is 17° C, and summer sea temperature is 21° C. There are many sunny days during the winter months. The average summer air temperature is 25° C, made pleasant by the mild 'maestral' wind – a messenger of good weather, while the 'bora' and the 'jugo' generally blow during the colder months. The coastline is beautiful, dotted with bays, beaches, steep cliffs and many forested islands. There is a great variety of flora, predominantly cypress, pine and olive trees, as well as vineyards, lemon and orange plantations – together with aromatic herbs and flowers, including exotic plants such as palm trees, agave and cactus, which create a special atmosphere. Nature lovers will find a true Mediterranean landscape here, while those fond of sailing will discover a wonderful sea and marinas. Dubrovnik public transport - Libertas Dubrovnik. Please check also - Dubrovnik Card. Due to Mediterranean climate the temperatures in the first week of October can rise upto 25°C (77°F) with small daily variations of the temperature. The sea surface temperature during the warm weather can be suitable for swimming, around 19-21°C (66-70°F). It is recommended to bring warmer clothing because the nights could be chilly, especially in case of Bora wind. Croatia is located between South-Central Europe and Middle Europe. Its shape resembles that of a crescent or a horseshoe, which flanks its neighbours Serbia, Bosnia and Herzegovina and Montenegro. To the north lie Slovenia and Hungary; Italy lies across the Adriatic Sea. Its mainland territory is split in two non-contiguous parts by the short coastline of Bosnia and Herzegovina around Neum. rocky coastlines on the Adriatic Sea (Istria, Northern Seacoast and Dalmatia). Phytogeographically, Croatia belongs to the Boreal Kingdom and is shared between the Central European and Illyrian provinces of the Circumboreal Region and the Adriatic province of the Mediterranean Region. According to the WWF, the territory of Croatia can be subdivided into three ecoregions: the Pannonian mixed forests, Dinaric Mountains mixed forests and Illyrian deciduous forests. The country is famous for its many national parks. Croatia has a mixture of climates. In the north and east it is continental, Mediterranean along the coast and a semi-highland and highland climate in the south-central region. Offshore Croatia consists of over one thousand islands varying in size. The largest islands in Croatia are Cres and Krk which are located in the Adriatic Sea. The Danube, Europe's second longest river, runs through the city of Vukovar. Dinara, the eponym of the Dinaric Alps, is the highest peak of Croatia at 1,831 metres above sea level. Croatia is a cultural, historical and natural treat for travelers.The most popular possibility for travel and tourism, of course, is summer tourism. You can also enjoy the benefits of rural tourism in many of the villages in the continental region of Croatia, as well as of health tourism in a number of spas and thermal and mineral springs, such as Varazdinske, Tuheljske, Stubicke and Krapinske spas, Lipik, Daruvar or Topusko in the continental region, and along the coast: Losinj, Umag, Opatija, Crikvenica, Hvar, Makarska, Vela Luka and Istarske Spa in Istria. If you are a gourmet and a connoisseur of fine food, or simply like tasty and healthy food, you will certainly more than enjoy Croatia. Croatia has a stable functioning market economy. International Monetary Fund data shows that Croatian nominal GDP stood at $50.053 billion, or $11,271 per capita, in 2007. In purchasing power parity terms, total GDP was $69.866 billion in 2007, equivalent to $15,733 per capita. According to Eurostat data, Croatian PPS GDP per capita stood at 57.5 per cent of the EU average in 2007. Real GDP growth in 2007 was 6.0 per cent. Convert HRK to EUR USD (using FX Currency converter).